Even though my son is already eight this year, I feel like I'm always learning to know what my child needs. And this is why and how I learn to cook this simple curry dish. Originated from Kerala, India, it is a fuss free, simple and mild coconut-based curry that is often cooked with chicken or fish. However, funny that molee is frequently misspelled as moolie, mooli, moli, moilee and even molly! LOL! Unlike other varieties of curries, molee is mild like korma curry but is less heavy than korma because of its thinner gravy. When I first saw this Southeast Asian influenced style of chicken molee which is misspelled as moolie in the book, the new Mrs Lee's Cookbook, Volume 2 by Mrs Chin Koon Lee, I know straightaway that this is a perfect curry to cook for my family. It is nicely flavoured with aromatic spices like tumeric, coriander and cumin and yet the spices are mild and not too hot and spicy for my chili-hating son. 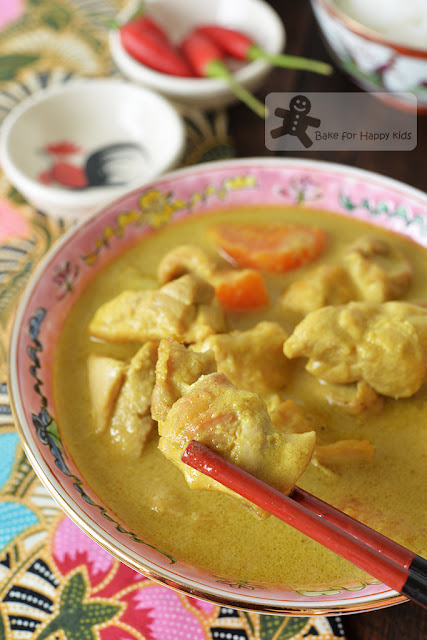 Hence, if you are like me, trying to cook for a combination of adults and children that can and can't eat spicy food or trying to introduce the taste of curry to young children, I must say that this is a lovely children friendly recipe to start. For this reason, I would rather name this chicken molee moolie mooli moli moilee or molly... the entry level chicken curry!!! LOL! "Mum, did you cook Japanese curry?" "Errr... Sort of" I replied with a guilty look because I didn't want my son to know that I didn't cook Japanese curry for him. "...but the house smells like Japanese curry!" "Errr... maybe home cooked Japanese curry?" I had to tell this white lie because I really want my son to try this curry. You see... Throughout all these years, I have tried to encourage my son to taste many different types of curry and my Aussie born son likes only ONE curry and it has to be the specific Japanese mild packet curry from a particular brand! Frankly speaking, I don't mind cooking this packet Japanese curry for him but still prefer to cook a simple recipe from scratch as we all know that the tasty packet curries are usually loaded of salt and unknown flavouring, additives and thickener. So, my version of chicken molee is slightly different from the recipe from the Mrs Lee's Cookbook. Mine is rather home-style type, cooked with carrot and potatoes... just like how I will cook my Japanese curry but not using the packet curry. Proudly presenting... my home-style chicken molee. 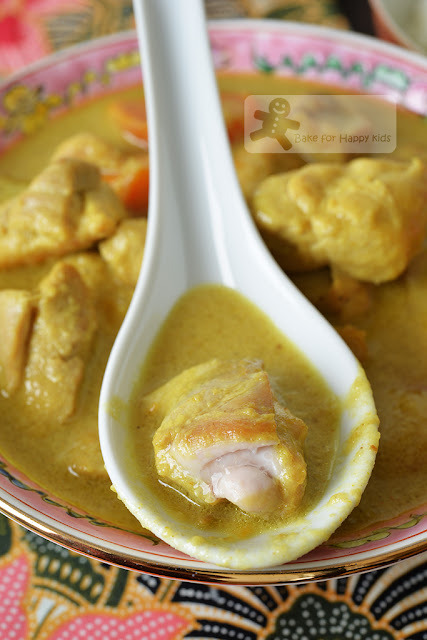 Tender chicken with potato and carrot, all simmered in coconut based curry gravy. ... but made from scratch and very yummy! Within minutes, this curry was gone! And I know that I have learned well to know my family because I have cooked a wonderful dish. Here's a video showing how I cooked my chicken molee. I usually cook extra to keep in the fridge and re-heat the leftover as one of our weekday dinners. You can cook just half this amount to serve a small family of 3-4. 1 tbsp sugar or more to taste - I used 3 tbsp brown sugar because my son likes his curry to be slightly sweet. Using a food processor or blender, process all rempah ingredients into a fine paste. Set aside. Heat 2 tbsp oil in a large cooking pot or wok with medium high heat until the pot or wok is hot enough. Depending on the size of your pot or wok, cook chicken in 2-4 batches for about 2-3 mins or until golden brown at the edges. Transfer the seared chicken into a plate. Add potato and carrot and cook briefly for 1-2 mins until slightly browned. Transfer the potato and carrot too into a plate. Set aside. Add another 2 tbsp oil into the same cooking pot or wok and heat until the pot or wok is hot and smokey. Add rempah into the hot oil and cook and stir for 5 mins with medium heat or until slightly caramelized and fragrant. Add about 1/4 cup coconut milk to stir and dissolve the rempah into a thick gravy first. Then, stir in 3/4 cup coconut milk. Bring mixture to the boil and stirring continuously to prevent the coconut milk from splitting. Return the chicken, potato and carrot back into the gravy and reduce heat to simmer. Cover the pot or wok and cook until the chicken, potato and carrot are tender, about 15-20 mins. When the chicken is thoroughly cooked to tender, turn off the heat. Stir in the remaining coconut milk and add sugar and salt according to taste. It's ok not to cook the remaining coconut milk especially if you are using canned coconut milk because it has been sterilized during the canning process. However, if you are not using canned or packet coconut milk and prefer to cook all of your coconut milk, you can cook the remaining coconut milk added with very low heat plus continuously stirring. Please do not boil it! Over-heating the curry will damage the creamy consistency of coconut milk and will also cause the gravy to split. 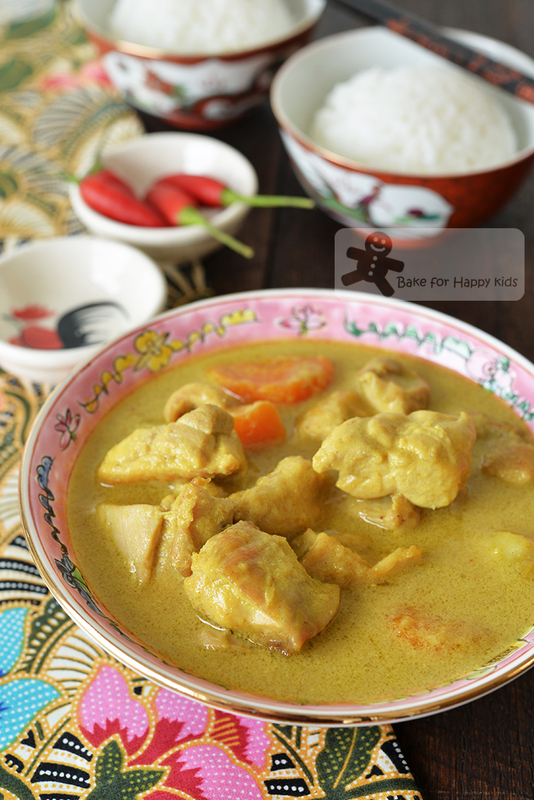 Serve immediately while the curry is still warm with steamed rice and extra chilies if desired. I grow up loving curry through roti prata, hope your son will like more curries, they are so delicious! This curry "molly" looks simple and delicious! Wow, very interesting curry ! Love the creaminess & richness of the gravy.